Virgin Galactic achieved a major milestone today with the first supersonic flight for its SpaceShipTwo suborbital vehicle. The rocket fired for a total of 16 seconds. Here's Virgin's press release, and two super awesome photos of the beautiful ship in flight. Make sure to click through to enlarge the beautiful photo. And scroll down -- there's also a video! 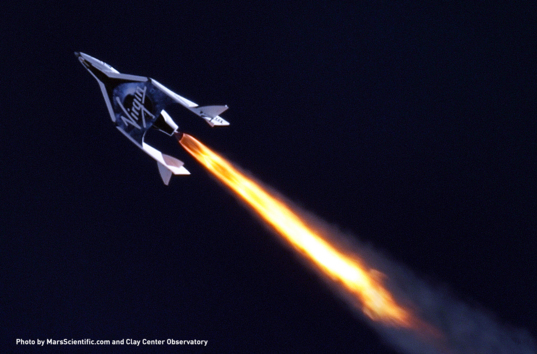 SpaceShipTwo fires her rocket motor in flight for the first time in a flight over the Mojave Desert on April 29, 2013. The view from SpaceShipTwo's tail as her rocket motor fires during her first supersonic flight on April 29, 2013. I hope to see more pretty pictures soon! Take care with your use of the photos though. Virgin Galactic is a private company, not a federal agency. NASA's images are in the public domain so you can do whatever you want with them. 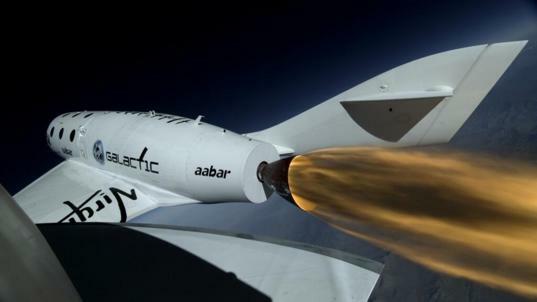 Virgin Galactic's images are shared under much more restrictive terms. The relevant section of their terms and conditions is section 9, where it stipulates that the photos are only for use in "professional journalistic context" and that they can't be used on commercial items, etc. I thought it was interesting that several people on Twitter were complaining about there not being a live feed of this test. People have been spoiled by NASA's openness. Nowadays with NASA the public rides along with all their endeavors, both successes and failures. Private companies like Virgin are not obligated to do the same; we should be happy they allowed employees to tweet the test so that those of us who were on Twitter could hear about it in real time. If you, as a member of the public, like being involved in space exploration, private spaceflight will disappoint you. That's one of many reasons we need to continue to support NASA. Not only do they do great things, they take the public with them. So write your congresscritter today. Private spaceflight won't disappoint you, but government will! Fed gov is bankrupt and must cut everything now by 30% just to stop increasing their already astronomical debt. Writting letters doesn't change that. It's the mathematically necessary and imminent future for NASA. PastAndFuture - nonsense. NASA spending returns dividends to the public in the form of R&D breakthroughs and a more educated, scientifically literate society. Think of it as an investment in our future. If we slash investment, especially haphazardly as you suggest, we can expect a much dimmer future. If you want to reduce federal spending, look to unnecessary subsidies to large corporations that benefit a decreasing share of society. So this is the future of private space flight? 60 years behind what NASA has already done and still not a manned orbit? Not impressed. So when will private enterprise launch it's counterparts to Hubble, Magellan,and JWST? Never. No short term economic return. But you cannot get that through certain people's minds who look at science through the lens of some economic model. AI, the US federal government counts dollars paid cash this fiscal year. And they borrow about 30% of what they spend now. And their debt is already bigger than the sum of market price for everything produced in the US during one whole year. Even with good intentions, they simply will not have the cash to finance them. Being poor is to think: "I know this would be good to do, but I can't pay for it, so it can't happen". That is a huge threat to NASA. With foresight something might be rescued. Plan B is to outsource planetary research to the private sector or to foreign governments which are not bankrupt. Of course, lobbying might lessen and delay NASA's share of handling the deficit. But just by a bit. 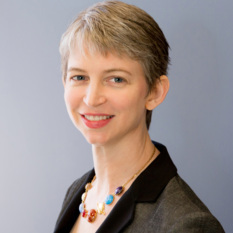 hi Emily imo you should be in the "loop" when it comes to this,so i got in touch with Sir Richard and told him about it.And i will continue to push for you to be included. thank you for explaining things so i can understand them. PastandFuture Hogwash. Private companies will never do planetary research. No profit involved. Private asteroid mining? Vaporware. Nasa would have to outsource by paying them more plus guarantees. So the result would be less technically capable companies having to re engineer everything even with free data and design from the US public. The problem is not debt, The problem is the anti science agenda in the USA based on rabid economic principal stirred up by certain politicians. Politics is not the realm of science. NASA is only under threat by a few creationist anti science politicians. NASA is more than capable of out doing any private company, they Launched a man into orbit in 1962. That is how far ahead NASA is.